Tropical storm Karen has been classified. 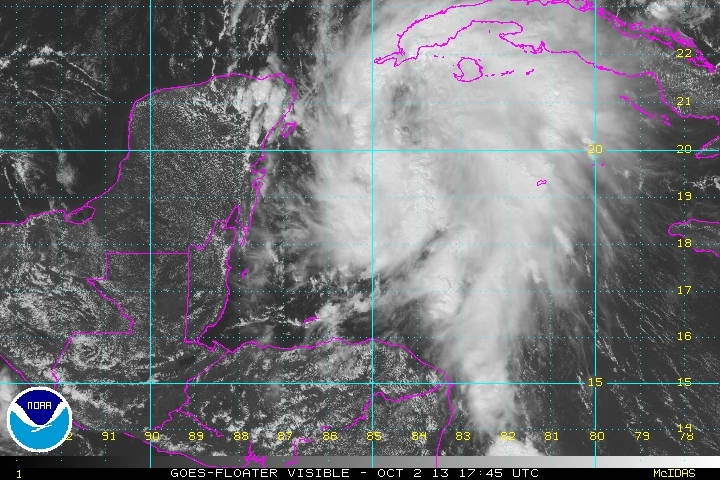 This disturbance drifted across the northwestern Caribbean the last several days with a core of heavy rainfall. Satellite imagery show an impressive low level circulation, but it is exposed by upper air winds. The heaviest rainfall is on the eastern half of the circulation over the southeastern Gulf. As of 10 am cdt (11 am edt) Karen was centered at 22.2 N / 87.9 W or 485 miles south of the mouth of the Mississippi River. It was moving north northwest at 12 mph. Top sustained winds estimated at 55 mph (65 mph NHC 10 am advisory). Pressure was estimated at 1004 mb. Forecast models take Karen north toward the Gulf coast by Saturday night or Sunday morning. Landfall is expected between the Mississippi / SE Louisiana and northern Florida coast. 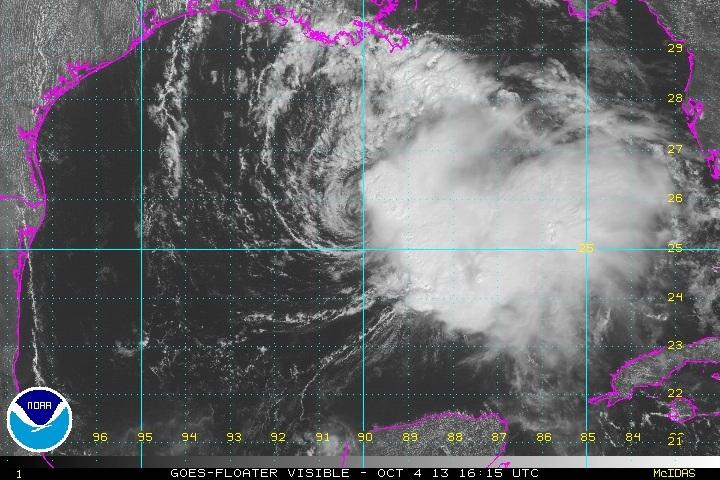 NHC has brought winds down as dry air and wind shear continue to disrupt the circulation of Karen. Heavy showers and storms remain on the eastern side of the circulation. It should be noted that the landfall location will not see the strongest effects if the circulation remains as it is now. Some power outages may occur if winds gust over 50 mph. As of 10 am cdt (11 am edt) Karen was centered at 25.6 N / 90.2 W or 250 miles SSW of the mouth of the Mississippi River. It was moving north northwest at 10 mph. Top sustained winds estimated at 50 mph (50 mph NHC 10 am advisory). Pressure was estimated at 1003 mb. 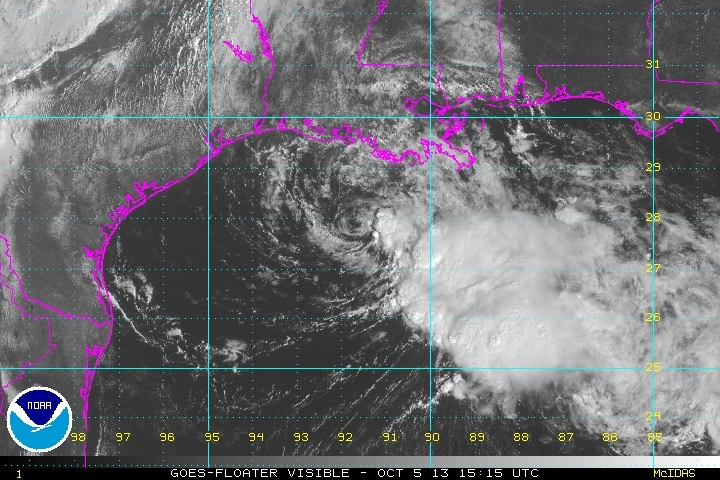 Forecast models take Karen north toward SE Louisiana coast by Saturday evening and then make a second landfall near the Mississippi / Alabama coast by Sunday morning. This is a very lopsided system and most of the "weather" will be east of the landfall area. 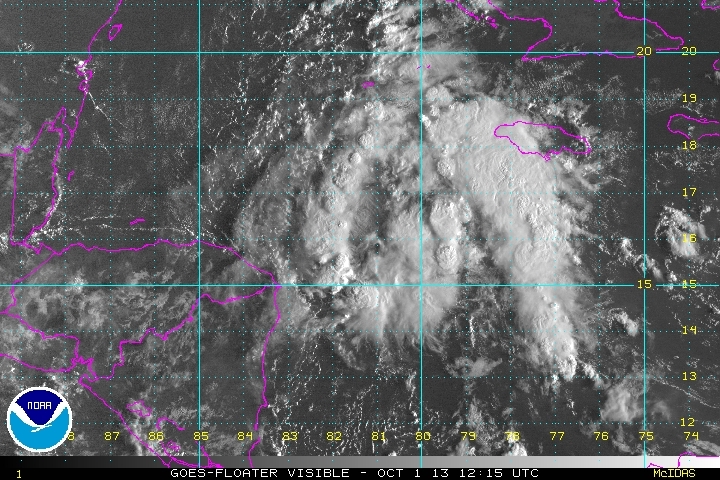 Karen is likely not a tropical storm. 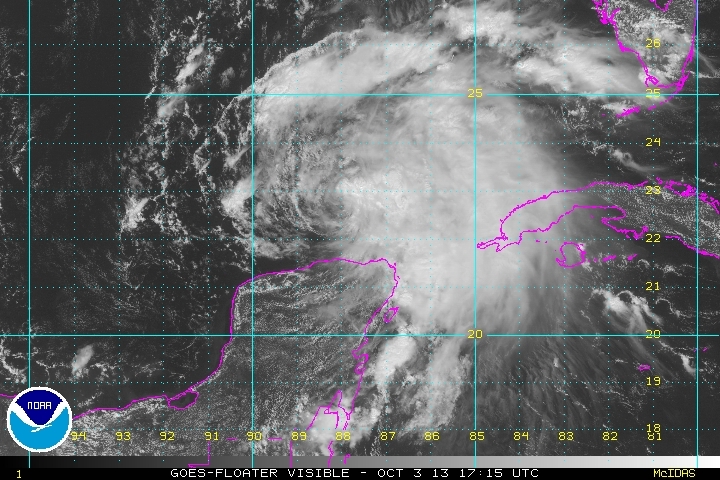 The center is clearly exposed from dry air and wind shear. Some deep convection is holding on the southeast side of the circulation. Heavy rainfall is still likely east of where the center makes landfall. Spotty power outages may occur if winds gust over 50 mph. As of 10 am cdt (11 am edt) Karen was centered at 27.9 N / 91.7 W or 180 miles WSW of the mouth of the Mississippi River. It was moving north at 8 mph. Top sustained winds estimated at 35 mph (40 mph NHC 10 am advisory). Pressure was estimated at 1008 mb. Forecast models take Karen north toward SE Louisiana coast tonight and back over water to make a second landfall near the Alabama coast Sunday.